On Sunday night’s program, George Knapp examined the UFO enigma with a jam packed show featuring ufologists, Paul Stonehill ( book link), Mack Maloney, Ed Komarek, Robert Powell ( book link), and Bill Chalker for a discussion on the Roswell incident of Russia, flying saucers in wartime, how UFOs relate to Exopolitics, and what governments from all around the world really know about these weird, unidentified, flying machines. During the first hour, researcher Paul Stonehill talked about the 1986 Dalnegorsk Incident in Russia, where a spherical craft crashed into a mountain. 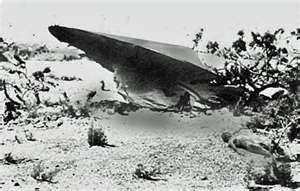 According to him, fragments from the crash were investigated by high level scientists who concluded, at the time, that it “could not be made on Earth with the level of our modern technology.” However, Stonehill explained, UFO researchers in Russia now believe the craft was actually a “reconnaissance probe” most likely sent by NATO. Despite these findings, he noted that “dozens of UFOs” were reportedly seen in the area in the days following the crash. Stonehill also shared his theory on the 1908 Tunguska event as well as the current climate of UFO research in the former Soviet Union. “Whatever UFOs are, they’re watching us and they’re watching us most intensely during wartime,” author Mack Maloney mused during the 2nd hour. Having examined this connection at length, Maloney revealed that he has begun to favor the concept that UFOs are time travelers from the future “coming back to see history as it’s being made.” During his appearance, Maloney talked about famous wartime UFO events such as a 330 AD sighting by Roman emperor Constantine prior to battle as well as modern cases like the foo fighter flap during WWII and even reports of anomalous lights in the Middle East leading up to the first Gulf War. “When UFOs start showing up over a place, it’s almost an indication that a war is going to break out there,” he observed. Also in the 2nd hour, Ed Komarek talked about his theory that the UFO cover-up is being orchestrated by an “alien resource cartel.” This cabal, he said, is comprised of major industries which hope to both protect their market share as well as profit from secret technologies gleaned from downed UFOs. Additionally, he contended that the wealthy elite behind UFO secrecy are afraid that the general population, should they realize how well ETs live, “we would want to emulate them and would have no use for the privileged class.” As such, Komarek claimed, the power brokers have “launched a covert war against the people of the world,” via the UFO cover-up, in order to maintain control over the populace. During the third hour, ufologist Robert Powell detailed the evolution of US government interest in the UFO phenomenon. He noted that early studies appeared to be good faith attempts at solving the enigma. However, Powell pointed to the 1953 Robertson Panel as a turning point in UFO history, since the group’s recommendations spawned an active debunking campaign to “demystify” the phenomenon. He also observed that lying to the public about official interest in UFOs, despite later FOIA releases disproving these claims, appears to be the standard operating procedure of the government. “By the time you release the documents, you have a new generation and they don’t really care about what happened 50 years ago,” he lamented. In the final hour, UFO researcher Bill Chalker joined Powell for a discussion on the history of ufology in Australia. He recalled how the Australian government grappled with the UFO enigma in the mid-1960’s and that the Air Forced actually dubbed them “unusual aerial sightings” as a way of avoiding the “flying saucer” stigma. According to Chalker, as the decade came to a close, official interest in the phenomenon by the Australian government slowed down via “a gradual process of almost intentional neglect.” In modern times, he said, the subject is marginalized by the government and that when new sightings are reported they are actually “farmed out” to UFO groups to investigate. On Saturday night’s program, John B. Wells welcomed Vince Rotonda and Colet Abedi, producers from the new TV series, Unsealed Alien Files, for a discussion on mass UFO sightings, personal abductions, government cover-ups, “photoshopping” of UFOs, the value of Wikileaks, and newly released documents that show how alien visitations have affected our past and what influence they will have on our future. In the first hour, author and researcher Steve Quayle warned of an orchestrated effort to destroy and takeover the United States and destabilize the world… cont.